Damo and Vikki's Round the World Trip! 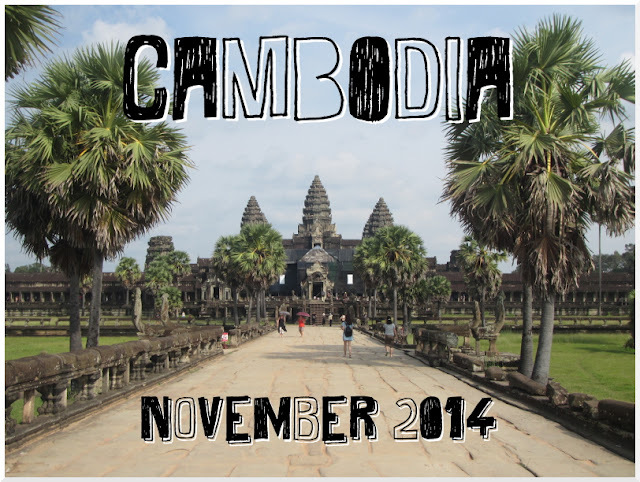 : Cambodia Highlights! We travelled to Cambodia after spending nearly two weeks in Vietnam (which you can read about here!) We got the Giant Ibis bus from Saigon to Phnom Penh, which took 7 hours. This included a couple of stops and crossing the border and getting our passports stamped! 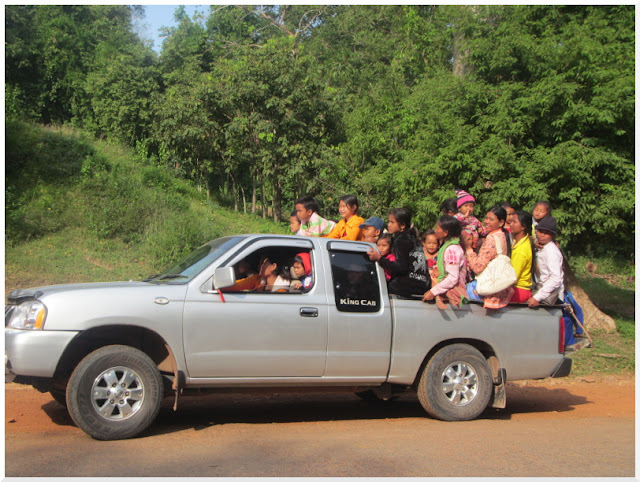 As soon as we crossed the border into Cambodia you could see that it was different to Vietnam, the roads became more like dirt tracks, it’s a lot less developed. 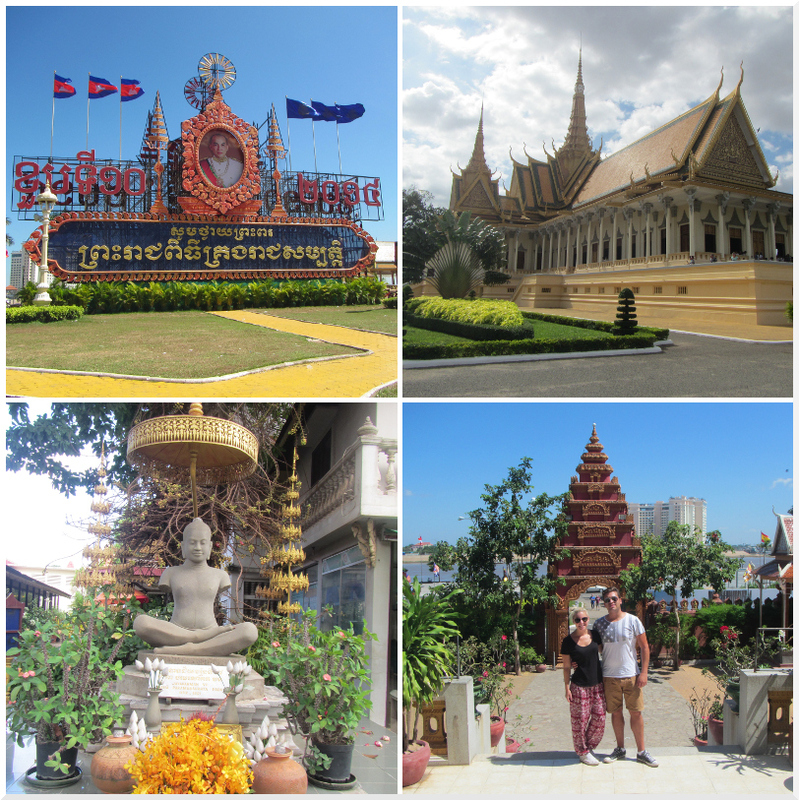 As we got into the city it was a lot more built up with proper roads, there were loads of monuments and temples, and photos of the king! 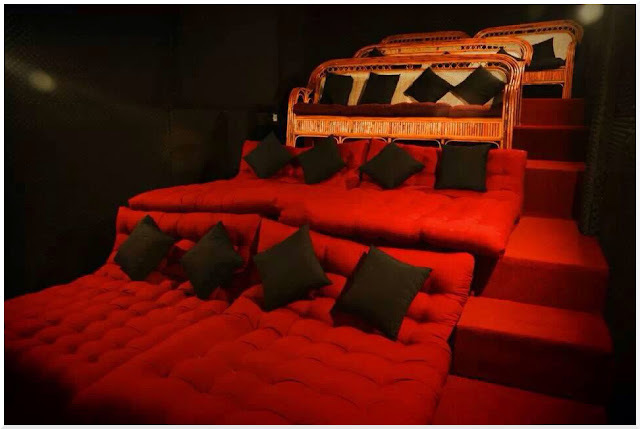 We checked into our hotel, Teahouse Asian Urban Resort which was so nice for the price we paid! We then walked to get some dinner and ended up in an Aussie bar, while we were eating there was a power cut and the staff all bought round candles so that was fun! The following day we got a tuk-tuk from outside the hotel, which is basically a motorbike with a seating area attached to the back, and is the most popular way of getting around! 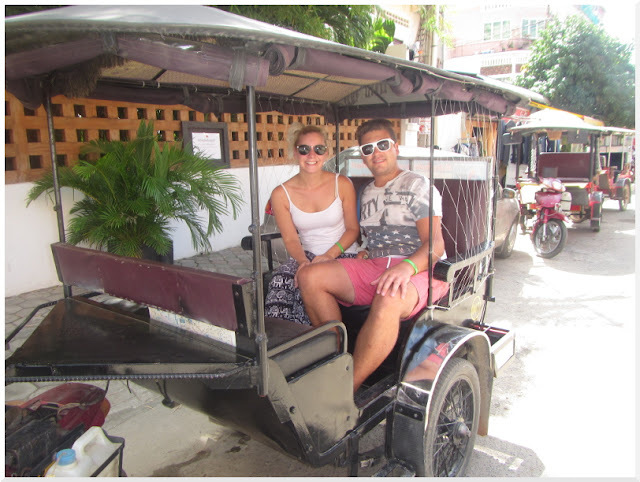 We got the tuk-tuk to the Killing Fields and the Genocide Museum, which were our main reasons for visiting Phnom Penh. During the 1970’s, Cambodia was ruled by Pol Pot, who tried to enforce his communist dream along with his army of soldiers the Khmer Rouge. Anyone who stood in their way was killed. They would target anyone who was well educated, spoke another language, they would even kill people who wore glasses as this meant they were intelligent! 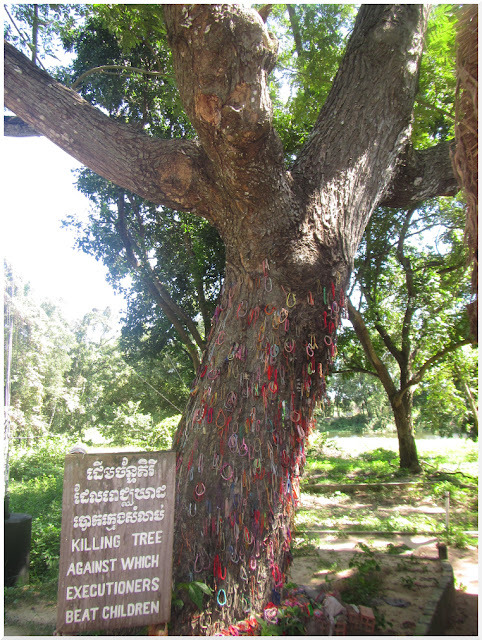 Thousands of people were taken to the Cheoung Ek Killing Fields where they were brutally murdered and thrown into mass-graves. The area is now a memorial and educational centre, and as horrible and incredibly sad it was, it was an amazing experience. It took about half an hour to get to the Killing Fields and entry was $6 which included an audio tour. The first thing you see is a stupa which is a memorial to all those that died. As you can see from the outside it's a beautiful memorial, but when you look inside you see the true scale of the genocide, with mass victims skulls preserved in glass cabinets from floor to ceiling. When taking a closer look at the skulls, you could see some of the injuries sustained, and we even saw one which had the remains of a blindfold still tied around it. As you walk around, the audio guide tells stories from survivors and some of the things were so hard to picture, as a lot of the structures were destroyed when it all ended. It's so hard to believe that all these awful events happened less than 40 years ago right on the spot where you're stood. We learned of the horrific way in which some of the victims were killed, for example throats being cut with sharp palm leaves just to save on bullets, and children being beat against a tree (known as the killing tree) all this before being thrown into a mass grave. The mass graves were found and dug up back in 1980, but after heavy rain pieces of clothing, bones and even teeth still make their way to the surface. After all the sad stories and loss of so many lives, it's still a great way to be educated about this country's important history and be able to show your respect for the victims. 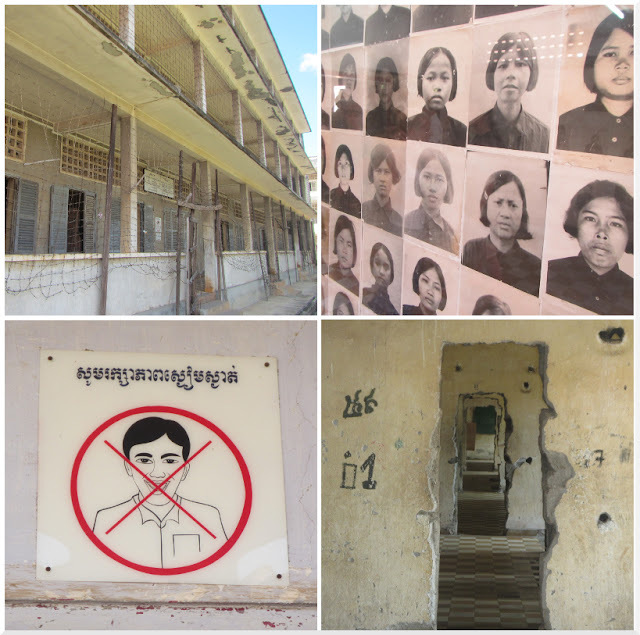 Our tuk-tuk driver then took us to the Tuol Sleng Genocide Museum, which was originally a high school that the Khmer Rouge converted into a prison which they called S-21. 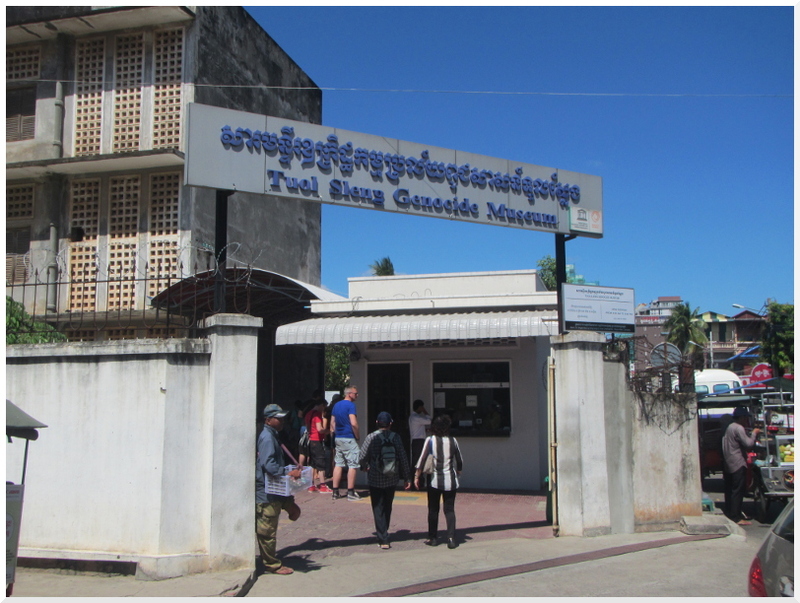 Thousands of people were bought there and tortured before being sent off to the Killing Fields. Inside the museum were 4 buildings, with walls and walls of photos of the victims, lots of cells and some of the equipment they used to torture people. There were around 17,000 people imprisoned at Tuol Sleng. From this outstanding number of people there were only 12 known survivors, of which there are only 3 still alive today. Upon exiting the last building, to our surprise it was a great honour to be able to meet one of these 3 extraordinary people, and even purchase his book! The following day we just spent looking around Phnom Penh, at the Royal Palace, the river, Independence Monument and a few other temples and statues. We walked around rather than getting a tuk-tuk but it was so hot and sweaty! That night we went to a place called The Flicks, which is a cinema with beds where you can even order takeaway to be bought to you! The tuk-tuk driver had no idea where the place was, as it’s an expat place so I guess locals don’t really know it, he had to keep stopping and asking his friends! 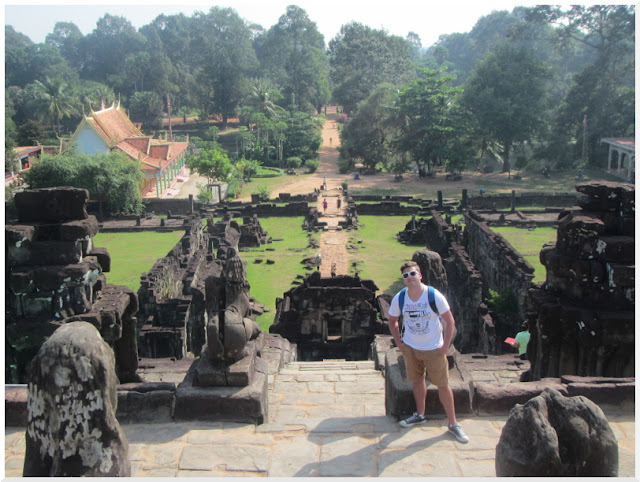 The next day was spent travelling to Siem Reap which took 7 hours on the bus! Siem Reap is the home of the temples of Angkor Wat, a huge complex of temples which were built hundreds of years ago. Some even date back to the 9th century! They were then abandoned for many years, and some became overgrown by the jungle, before being re-discovered many years later. We stayed at a lovely place called Schein Guesthouse, and the owner was really helpful with which temples we should see and the order we should do it all in. We decided on the large circuit the first day and the small circuit the second day, as it saves the more impressive and well-known temples til last. We got a 3-day pass, which you can use within 7 days, so we could go and see some more further out temples on another day as well. On the first day we saw 7 different temples, some were huge and some tiny! They are amazing to see and I have hundreds of photos from the first day alone so below are a small selection!! At one of the temples we bought some fridge magnets from a little girl saying “3 for 2 dollar,” I was like ooh that’s cheap! Damo thought it was a dollar each so gave her $3 for them, then a younger girl came over saying “4 for 1 dollar!” I was like damn we got ripped off!! Haha! 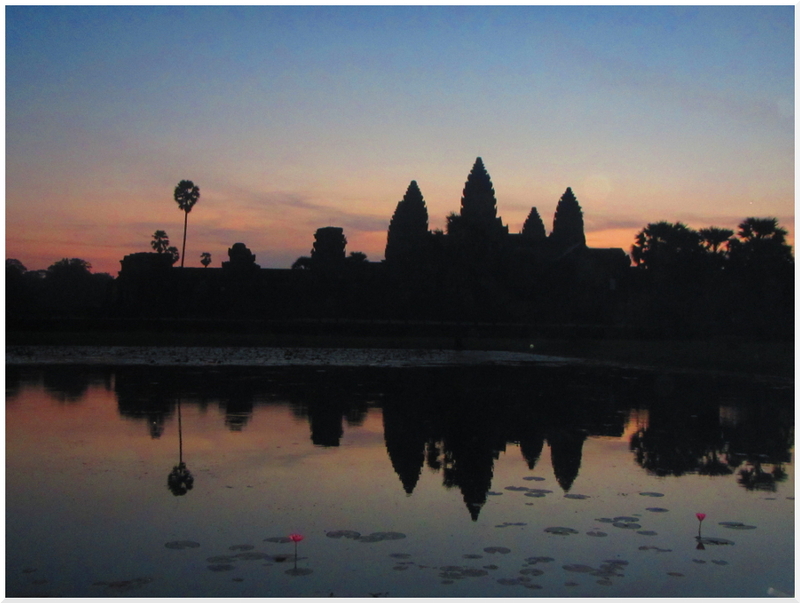 The following day we left the guesthouse at 4.45am so that we could watch the sunrise over Angkor Wat! When we arrived there were already hundreds of other people making their way towards the temple in the dark. We got to the lake in front of the temple and stood behind a couple of Chinese tourists, it was a great spot and we got some great photos! The tourists in front of us kept turning round and taking photos of me and I have no idea why! Damo took this photo of all the people also watching the sunrise! 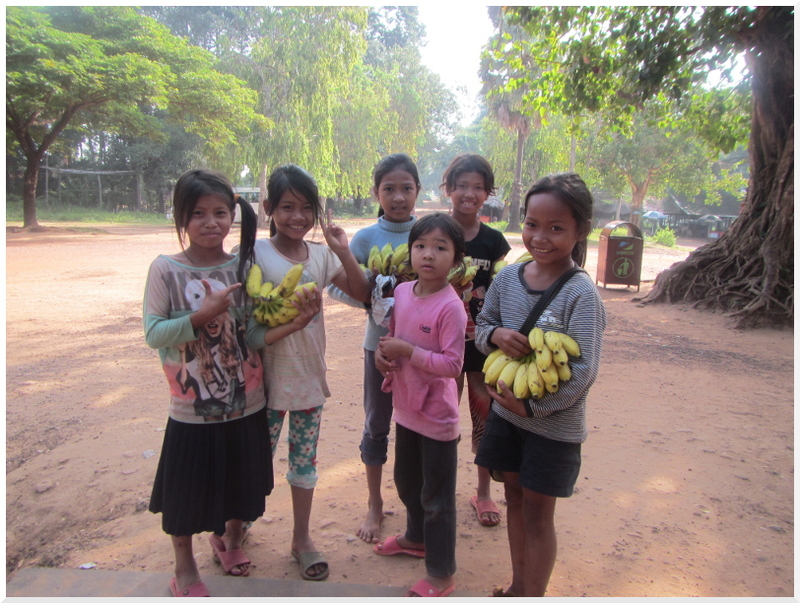 After watching the sunrise we met back with our tuk-tuk driver and got some breakfast then headed towards Angkor Thom. On the way we stopped at Phnom Bakheng which is a hill a lot of people climb to watch the sunset. There was a great view from the top although we weren’t too bothered about watching the sunset from there. 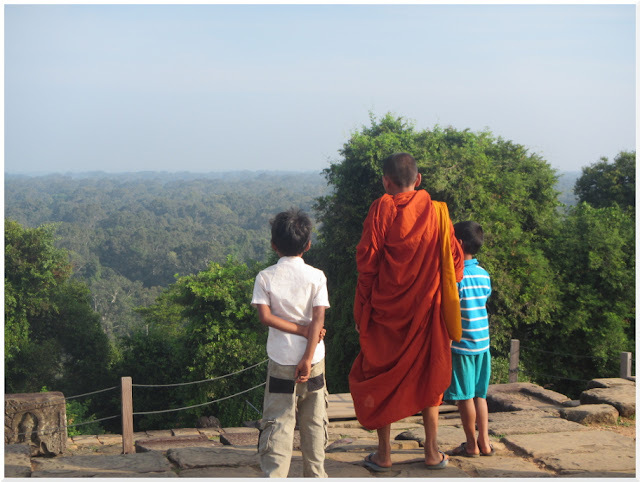 After making our way back down we stopped at a small temple with really steep steps called Baksei Chamkrong, then went through the South Gate of Angkor Thom. When we came through the gate we saw this pick-up packed full of kids! We continued on to Bayon, which has lots of carved faces. When we arrived there we saw that you could ride an elephant round the temple for $15! I wasn’t sure if it was cruel or not but Damo really wanted to do it so we did. Elephants are my favourite animal! 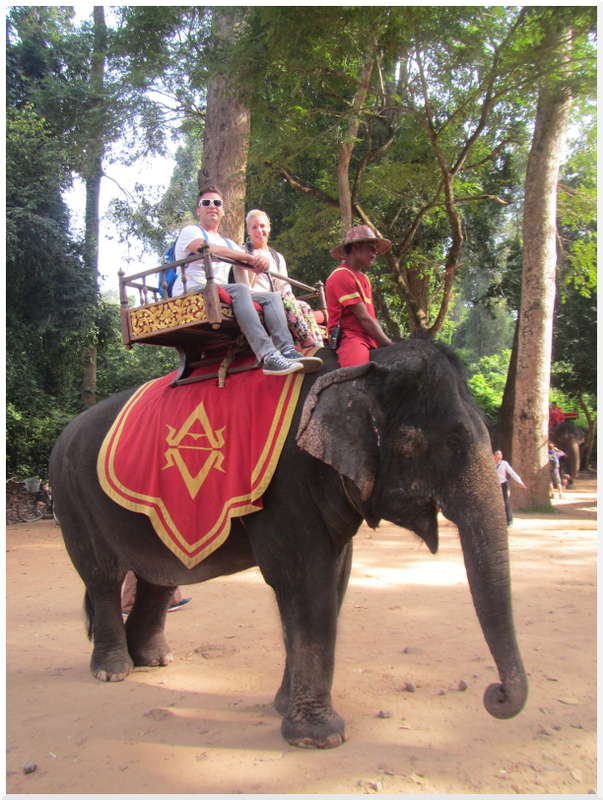 It was a brilliant experience and we bought and fed our elephant lots of pineapples too! I have since read online that elephants are treated better in Cambodia than they are in Thailand, but I’m not convinced and I don’t know if I’d do it again. We have booked to go to an elephant rehabilitation centre when we go to Thailand and i’m so excited for that!! After the ride around it, we went inside Bayon temple. It was really busy but was so awesome to see all the carvings in the walls and the giant faces. After leaving Bayon we saw a huge Buddah, there were lots of insence sticks burning and some ladies sat there, I thought if I went over they might bless me or something but all they did was tie a bracelet round my wrist and make me pay $2 for it!! What a scam haha! 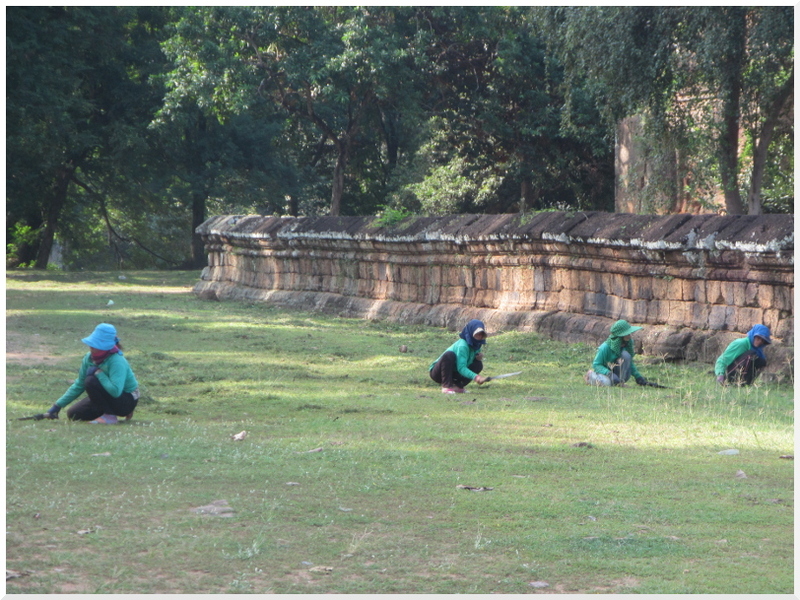 We then walked past Baphuon, looked at the Terrace of the Elephants and walked along to the Terrace of the Leper King. 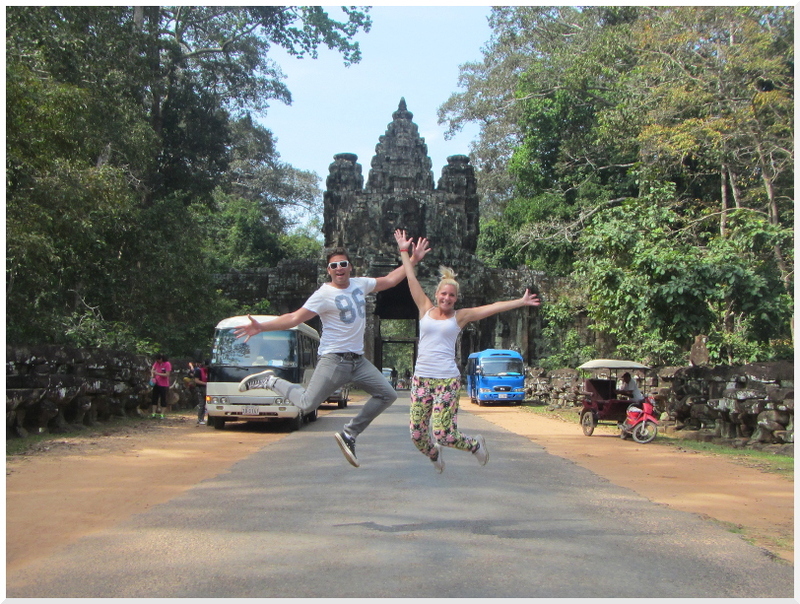 Met back with our tuk-tuk driver and left Angkor Thom through the Victory Gate, where he took this photo of us! 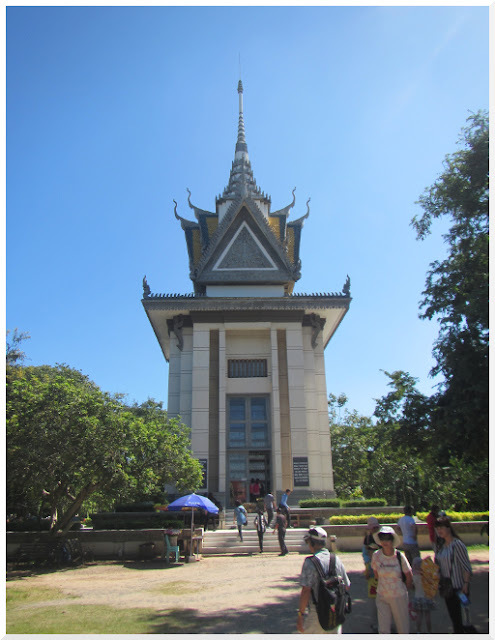 We then went to see 2 smaller temples opposite each other, Thommanom and Chau Say Thevada, and then stopped at Ta Keo, at this point we were getting a bit templed-out so we just took a photo of it. 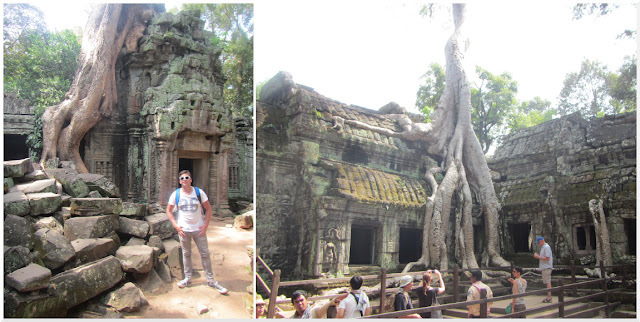 After that we went to Ta Prohm, which is the temple from Tomb Raider! This one was really cool as it has been taken over by the jungle and has trees growing out of it in a few places. 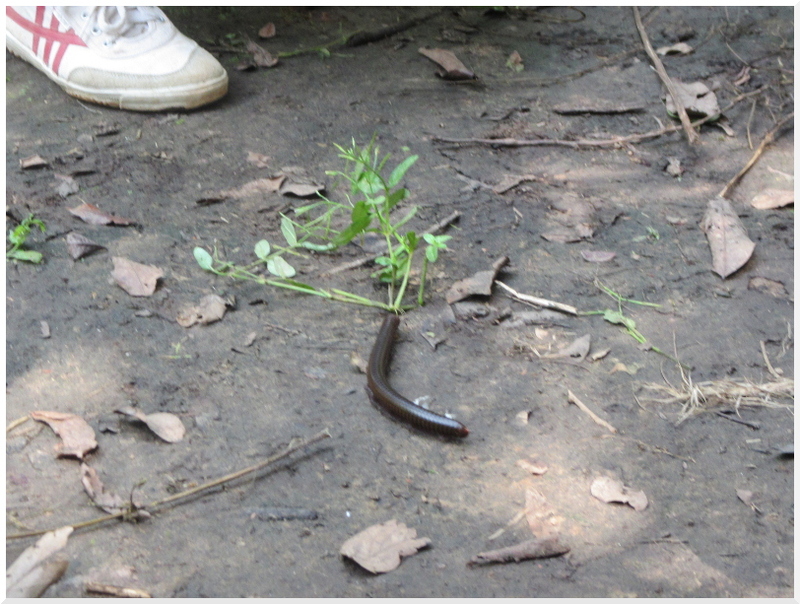 We then stopped at the small but pretty Banteay Kdei, then our tuk-tuk driver took us to a food stall and bought us some frog! It was stuffed with spices and it was actually so nice! Some cute dogs smelt it and wanted some too! We finished back at Angkor Wat, which we probably should of explored first, as by this point we had had enough really! But we still spent a while looking round it all. That evening our driver took us to a dinner show that he had told us about. 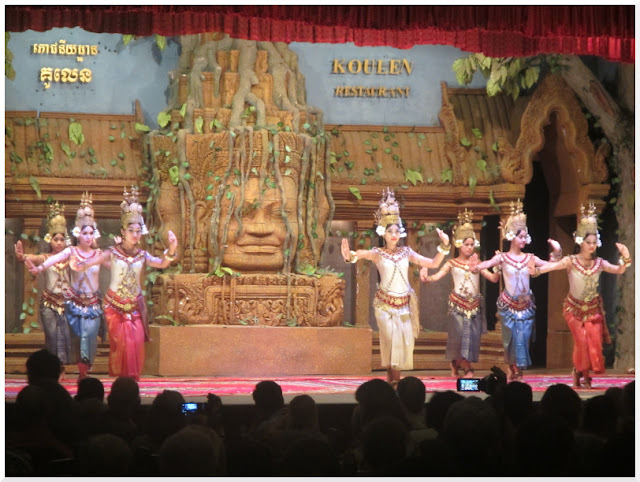 It was brilliant, there was a huge buffet and traditional dancing which I had really wanted to see. 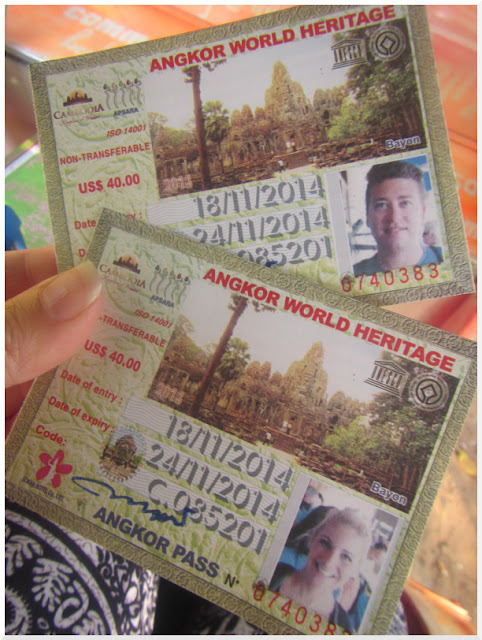 He didn’t even charge us anything for the tuk-tuk ride and bought us a traditional Cambodian scarf each as a gift! The following day we had wanted a break from looking at temples, but a few other people from our guesthouse had arranged a trip to see some of them a bit further out. 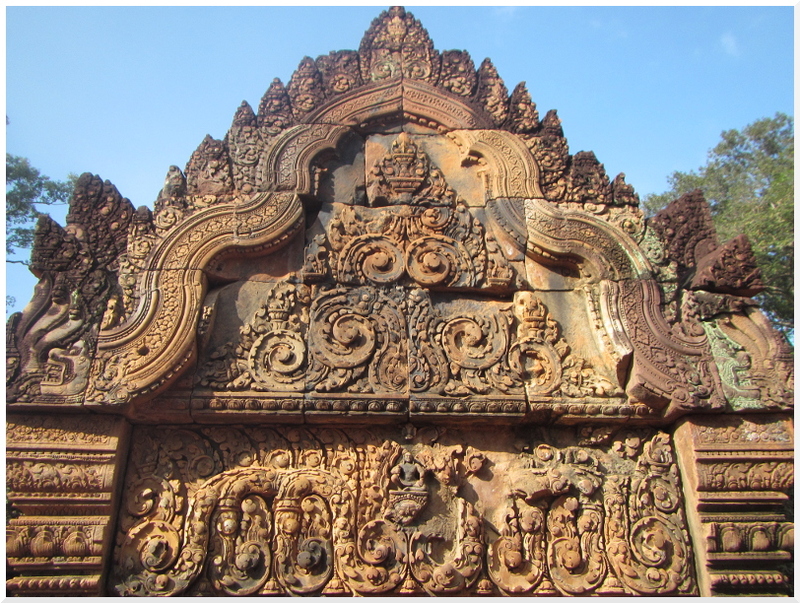 This included a trip to Banteay Srei, which I really wanted to see, so we decided to go along too. Unfortunately this meant being stuck on an uncomfortable minivan all day with mainly nice people but also a couple of mega annoying ones!! First stop was the Rolous group, some of the earliest temples, which we found a little boring but as they were on the way I think it made sense to stop there. They were also a lot quieter then the main Angkor temples. 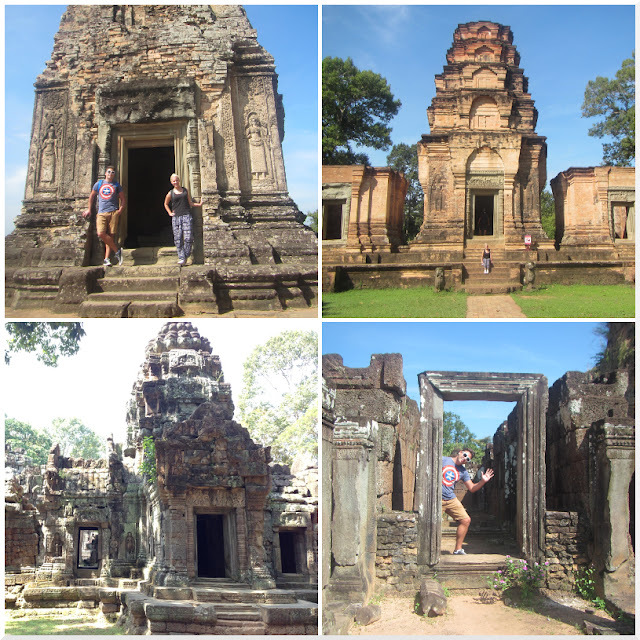 We saw Preah Ko, Bakong and Prasat Prei Monti. As we walked up to the second temple, there were some ladies kneeling on the grass with knives, our guide made a joke about us witnessing a Cambodian lawn mower in action! Literally that is how they cut the grass! 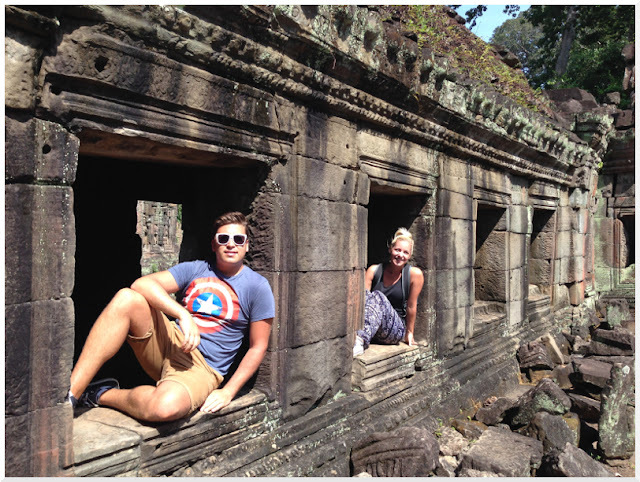 We then travelled for 1 hour to get to Beng Mealea, which the owner of the guesthouse had told us was his favourite temple. 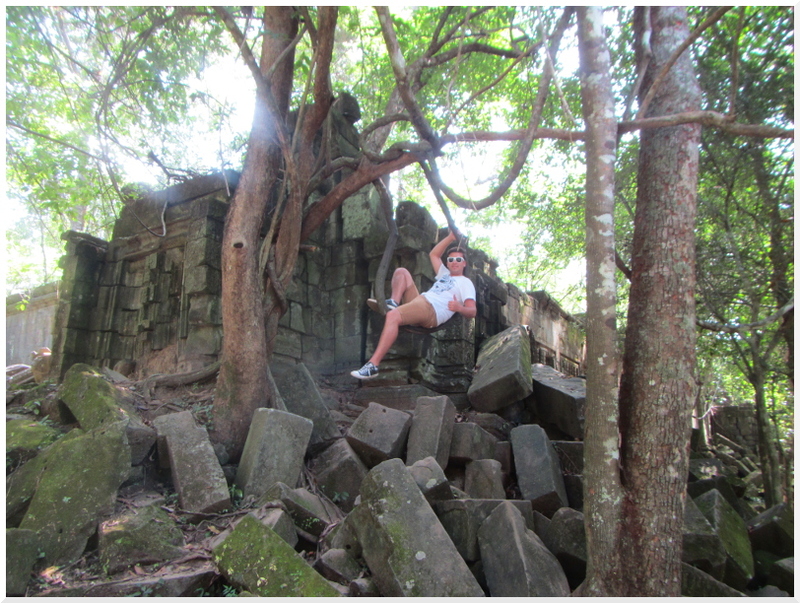 It was a jungle temple like Ta Prohm, but a lot more of it had collapsed and it was fun climbing over all the rocks! We saw a giant millipede, a massive spider and a chipmunk looking animal in a tree! 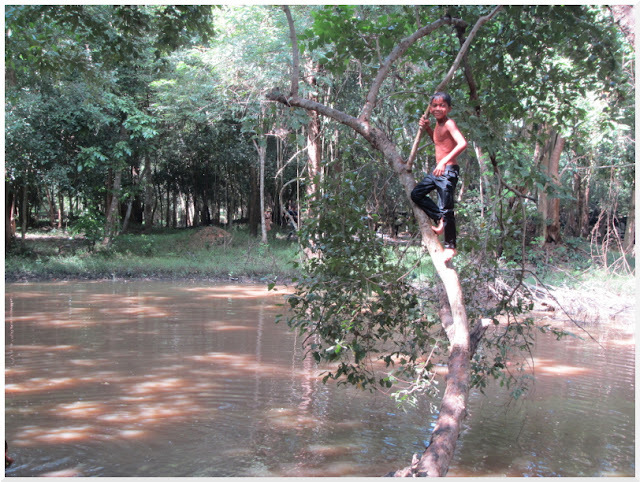 As we left the temple we saw some kids jumping from some trees into a lake, some of them were climbing so high up! We had some lunch then travelled to Banteay Srei, I had been looking forward to this one all day but it wasn’t as great as I thought it would be, maybe I just wasn’t in the mood for more temples, it also didn’t help that the sun was in a bit of an annoying place! It was really crowded too. The carvings on this temple are so amazing and detailed though, and it was awesome to see them! We finished the trip at a temple on the top of a mountain called Phnom Bok, which is rarely visited by tourists. It wasn’t anything special at all. Our guide also told us it was time to go back down before the sun had even set which was annoying, and as we made our way to the bottom we could see that the sky was changing to pretty colours! 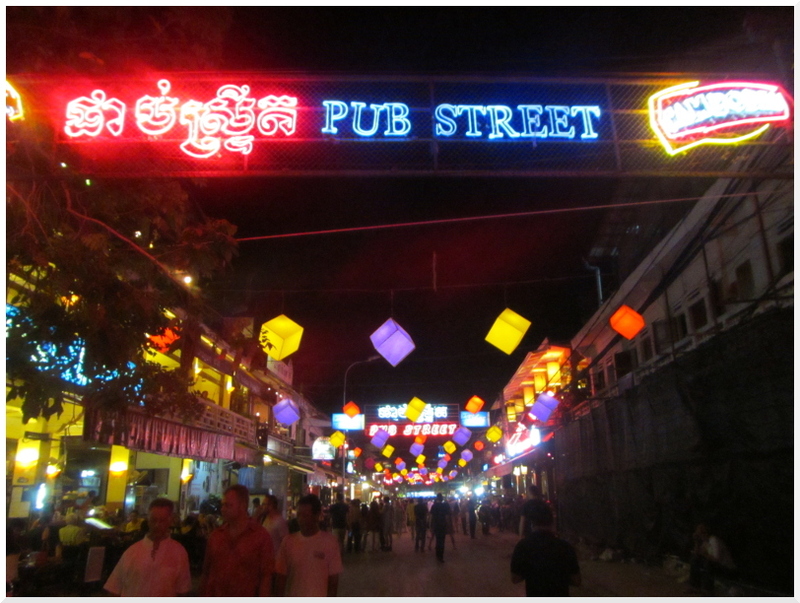 That night and the following night we got a tuk-tuk to Pub Street, which is the main nightlife area in Siem Reap, and full of tourists. There were loads of places to eat and some night markets too. There were a lot of annoying tuk-tuk drivers that just follow you around but the atmosphere was great!